Fairmount Automation played a central role in the execution of the DD(X) program’s Autonomic Fire Suppression System (AFSS) Engineering Development Model (EDM) effort on ex-USS SHADWELL. The DD(X) AFSS is being developed to enable reductions in damage control manning and to mitigate firefighting risks associated with a weapon-hit scenario. In peacetime scenarios, the DD(X) AFSS is to suppress, contain, and possibly extinguish shipboard fires with an unmanned response. In wartime scenarios, the DD(X) AFSS is expected to contain and control weapons-induced damage by establishing fire boundaries within the primary damage area (PDA) and maintaining the integrity of the fire suppression system. The primary objective of the AFSS EDM was to demonstrate that the AFSS, augmented by the Damage Control (DC) manning organization, could contain combat damage fires to the PDA and prevent fire spread to the areas adjacent to the primary damage area (APDA). Onboard ex-USS SHADWELL, the system Fairmount Automation designed and deployed was to enable the control of a fire suppression system that autonomously reacted to peacetime and wartime fire scenarios. The AFSS EDM testing was also to focus on minimizing the risks associated with an autonomic and minimally manned damage control system in high-threat spaces (e.g., AGS and PVLS magazines and machinery spaces). Success with respect to these goals depended on several factors. First, the AFSS had to automatically isolate damage and reconfigure so that intact portions of the system remained operational (no single point of failure should ever prevent the AFSS from fulfilling its intended design purpose of maintaining fire-suppression). Second, the AFSS had to prevent fire spread by automatically isolating damage and reconfiguring itself. Third, the DC organization had to be able to direct manual actions in an effective manner to augment the automated system response. 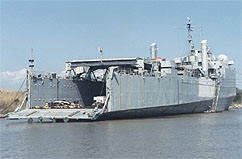 The AFSS deployed on ex-USS SHADWELL is composed of three elements: (i) the Fire Suppression System that provides the means for suppressing fires and damage, (ii) the AFSS Control System that provides the automatic controls for managing and conducting firefighting activities, and (iii) the DC manning organization that orchestrates the first two elements to prevent and suppress casualties and damage. For the EDM effort, Fairmount Automation was charged with developing the AFSS Control System portion, based on its prior experience in that capacity during the successful execution of a Weapon Effects Test (WET) conducted on ex-USS PETERSON. The ex-USS PETERSON WET consisted of three test events that were completed in February 2004 and were designed to demonstrate the fully automatic (unmanned) response of the AFSS to a weapon hit. See the following section for more information on Fairmount Automation’s role in that WET effort. The AFSS Control System that Fairmount Automation developed during the EDM is made up of two primary components—the Device Level Control System (DLCS) and the High Level Control System (HLCS)—as well as two supporting components—the Distributed Control Network (DCN) and the 24 VDC Power System. DLCS software agents communicate over the DCN to autonomously maintain fire suppression system pressure, to activate the fire suppression system when fire is detected, to autonomously reconfigure the piping system to maintain the effectiveness of the AFSS when ruptures occur, and to provide situational awareness to the HLCS. The HLCS is comprised of three Human-Computer Interface (HCI) workstations and their associated software, an Advanced Volume Sensor Prototype (AVSP) that collects, fuses and measures image and acoustic-based data together to detect multiple types of casualties on a per-compartment basis, and several digital video cameras and servers. The HLCS consists of a high-level software module (HLSM) that resides on the HCI workstations and is capable of monitoring, displaying, and fusing information reported by devices on the DLCS. The system supports a remote mode of operation wherein the DC organization can direct manual actions through HCI workstations. During the EDM, Fairmount Automation was involved in all aspects of the AFSS Control System design, implementation, testing, and validation process. Fairmount Automation had responsibility over the entire system development lifecycle, including (i) system and software requirements analysis and definition, (ii) system and software architecture design, (iii) creation of a Software Development Plan (SDP), (iv) creation of a Quality Assurance (QA) plan, (v) creation of a Configuration Management (CM) plan, (vi) creation of a software integration and testing plan, (vii) creation of a Software Certification, Verification and Validation plan, (viii) implementation of all of SDP, QA, CM, and V&V plans, (ix) detailed system design, (x) software coding and unit testing, (xi) factory acceptance testing, (xii) system integration and testing on ex-USS SHADWELL, (xiii) EDM scenario testing, and (xiv) EDM scenario testing reporting.